"The Evangelical Lutheran Deaf Association (ELDA) is a national Lutheran organization of Deaf ELCA congregations, interpreted ministries, and their members which supports a core value of ASL and American Deaf Culture. ELDA advocates Deaf spirituality and empowerment, Deaf global missions and youth outreach, interpreter training, and hosts a biennial conference. Please visit the website for our partners in ecumenical ministry, the United Methodist Deaf Chruch. As a partner in the Deaf ELM collaboration between Deaf ministries, we seek to share information and resources in ways that strengthen and support one another. You can read more about this partnership at, https://www.umcd.org/newsnat/1501.html. Feel free to explore their website, contact them about attending churches, participating in mission trips, and other opportunities for shared ministry. The Evangelical Lutheran Deaf Association is comprised of member Deaf churches, Deaf ministries and individuals within the Evangelical Lutheran Church in America (ELCA). Prior to the year 2000, it was clear that a nationwide organization was needed that could provide support, education and information sharing among the churches and ministry services within the ELCA. ELDA was formed. To help accomplish this, a new position was needed within the ELCA to coordinate and help strengthen the churches and ministries serving the Deaf and hard of hearing in the United States. A resolution was created and passed, see below. 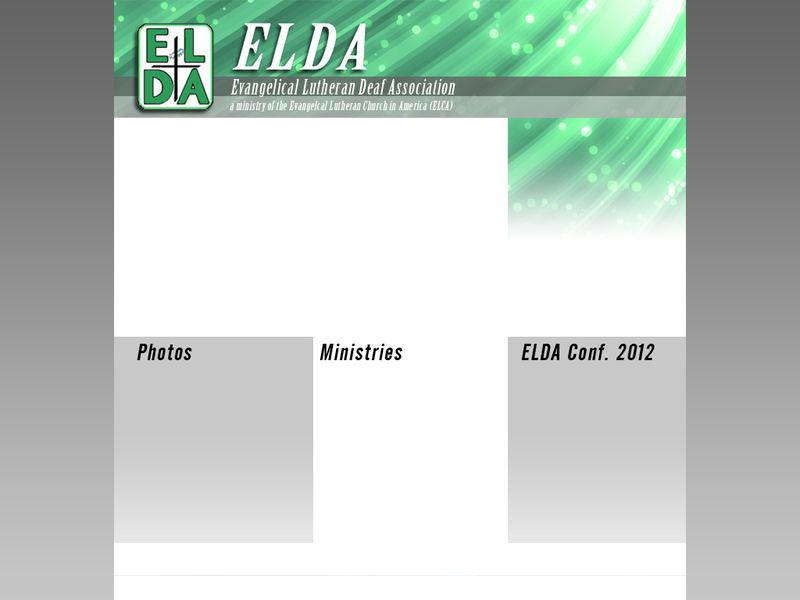 The churches began meeting at conferences every two years, a newsletter was created to keep the churches networked and communicating with each other, and now, ELDA is on the Web! Be it further resolved that, in the spirit of the ELCA constitutional mandate that, whenever possible, decisions should be made with the people most affected, at least one half of the search committee for this position be Deaf and persons selected by ELDA. The above resolution resulted in the creation of a part-time position: Director of ELCA Deaf Ministries, currently held by Rev. Beth Lockard.